Message summary: Today we encourage you to check your distress level concerning the darkness that surrounds you. Like Paul, let us boldly speak out while God’s light shines brightly through us! It isn’t enough to speak the truth, for we must also live in the truth of God’s Word. “While Paul was waiting for them in Athens, he was greatly distressed to see that the city was full of idols. So he reasoned in the synagogue with the Jews and the God-fearing Greeks, as well as in the marketplace day by day with those who happened to be there” (Acts 17:16,17). I (Stephen) enjoy satire as a means of stimulating thought (Brooksyne not so much). For the last several years I have read from the Babylon Bee blog. The writers have a real knack at pointing out the absurdities of modern life, including the foibles of the church and religious world with satire. I don’t always agree but they do make you think. I read a recent article titled “Facebook To Replace All Reaction Buttons With Pure Outrage” (link below). It makes fun of the constant outrage so many seem to be in, regardless of the subject. I saw a video from a college campus where the speaker couldn’t even speak because some of the students were so outraged at his views, which were imminently reasonable and would not have even been controversial just 20 years ago. Some Christians also seem to live in state of distress and outrage as well. This can sure lead to a less than positive witness. But is there ever a place for distress and outrage? We believe there is. Various Bible prophets were “outraged” at the idolatry they dealt with. Jesus was “outraged” at the carnal activities of the temple money changers. (John 2:14-16) Some may take offense at “outrage” used here but indeed He was. Today let us examine a time when Paul was “greatly distressed”. (Note: I realize that outrage and distress are not entirely synonymous but both convey a similar outlook). Athens was an intellectual and cultural center of the ancient world, a beautiful city that is a popular tourist destination to this day. In the providence of God Paul was led there and while waiting for his ministry associates, Silas and Timothy, “he was greatly distressed to see that the city was full of idols“. He sought to minister truth to the people in Athens. 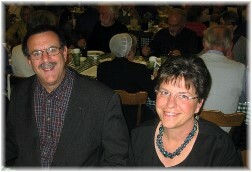 His “redeeming the time” while reaching out to others’ in spiritual need is a shining example for us today. But what struck Paul, recorded by the historian Luke, was his being “greatly distressed to see that the city was full of idols“. Other versions state, “his spirit was being provoked within him” (NASB), “his spirit was greatly angered” (Amplified), “his spirit was greatly upset” (NET), “he was deeply troubled” (TLB). When we walk in the light we should be distressed by darkness. The verses that follow reveal that this distress did not lead Paul to despair but to a bold proclamation of the truth that brings light. Paul saw the city from a spiritual perspective. Being grounded in his knowledge of the Law of God he was “greatly distressed to see that the city was full of idols” (v.16). I understand these idols are now among the tourist attractions of Athens but to Paul they were a stark reminder of man’s ignorance and disobedience to God. Rather than being impressed Paul was distressed. As we walk with a spiritual perspective this should be our reaction as well, even to the many wonders of our modern day “Athens”. Like Athens of old many feel so superior in their wisdom and intellectual giftings but we must remember Paul’s solemn word to the Romans, “Professing to be wise, they became fools, and exchanged the glory of the incorruptible God for an image in the form of corruptible man and of birds and four-footed animals and crawling creatures” (Romans 1:22,23). We need to realize that in God’s providence He has placed each of us where we are and His will is that we walk and speak out as His witnesses. Today look for appropriate times to speak out and express your faith. Many will ignore or mock you. Paul experienced that, “some began to sneer” (v.32a). 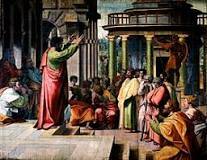 Others will say, “we want to hear you again on this subject” as they did in Athens (v.32b). And some will believe (v.34). Today we encourage you to check your distress level concerning the darkness that surrounds you. Like Paul, let us boldly speak out while God’s light shines brightly through us! It isn’t enough to speak the truth, for we must also live in the truth of God’s Word. 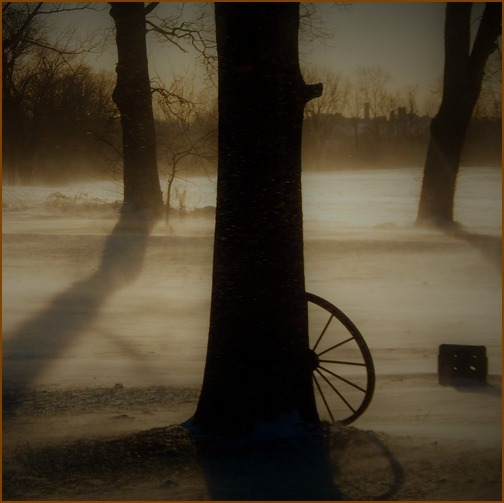 Daily prayer: Father, there are numerous subject matters that are troubling to the believer and can even cause distress and outrage as darkness continues to spread throughout our land. What a blessing to know that the darkness of sin cannot overcome the light of Truth revealed through Jesus who is the Way, the Truth, and the Life. But we, as believers, must be very careful that our distress and even outrage at times leads us to a faithful witness even as Paul demonstrated in Athens. Help us not to distort, dilute, or digress from Your Biblical instruction. We ask that those walking in darkness will see the light of Christ shining through us. It is in Jesus’ name that we pray. Amen. In studying Acts 17 for this lesson it’s interesting to observe that Luke made parenthetically as he later recorded the event: “(Now all the Athenians and the strangers visiting there used to spend their time in nothing other than telling or hearing something new)” ,v. 21. That sounds like so much of academia! 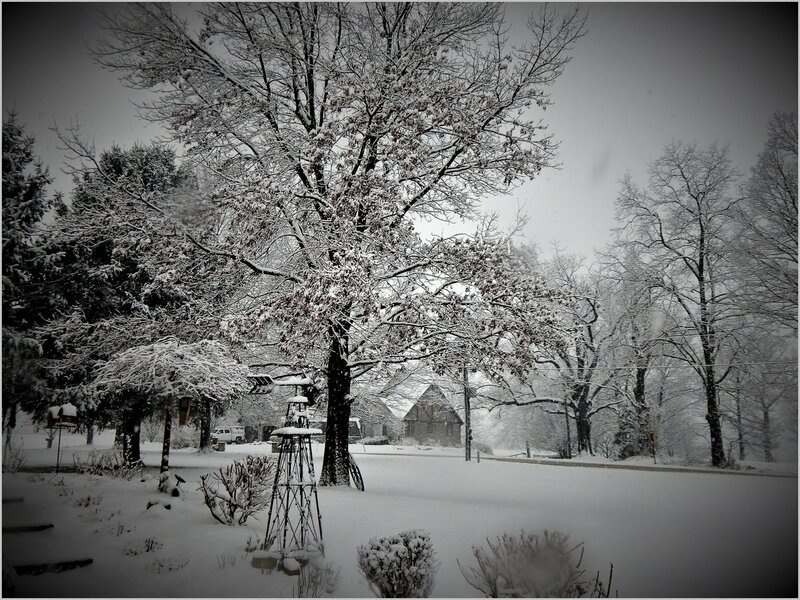 Today we share some more photos from our last several days of extreme cold and snow. It’s still very cold this morning but projected to rise to a high of 20° today. But Saturday it rises to 40°! 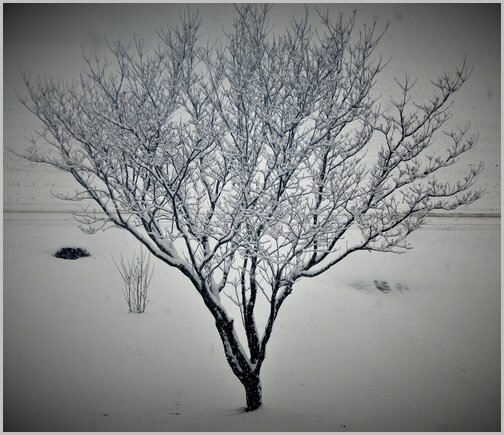 Our front lawn dogwood tree is starkly beautiful in the snow. 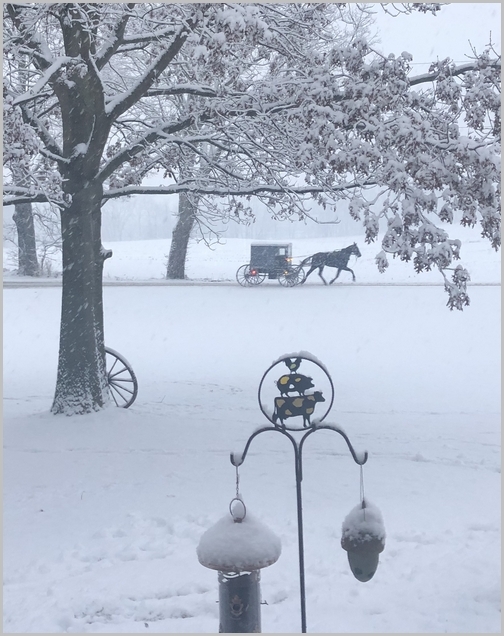 Our Amish neighbors were out late Tuesday afternoon when the snow was really falling heavy. 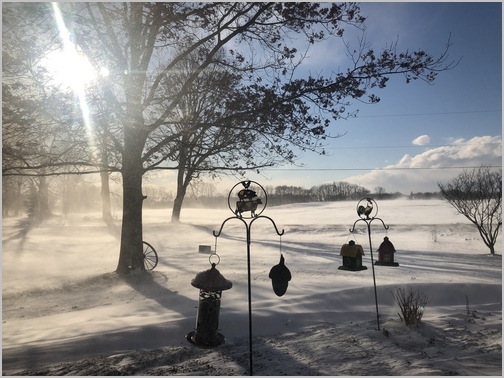 This photo was taken Wednesday afternoon when the winds were howling. 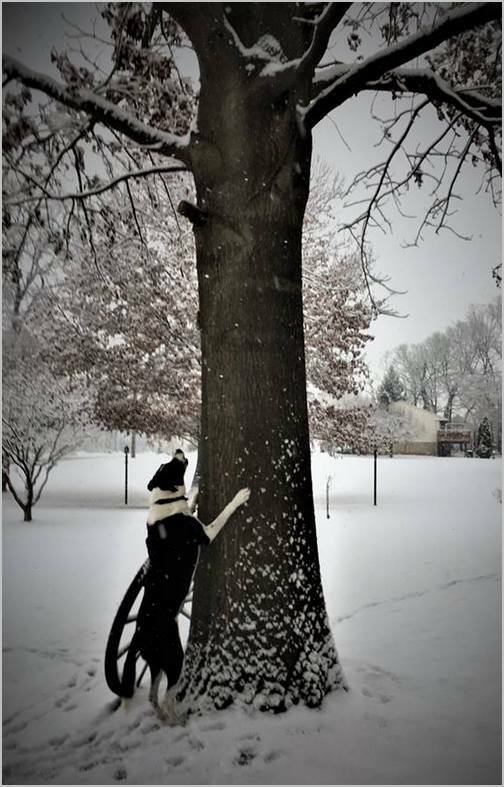 Mollie will chase squirrels in any weather! Does this look cold or not? Notice our recycle bin emptied and blown in from the road.